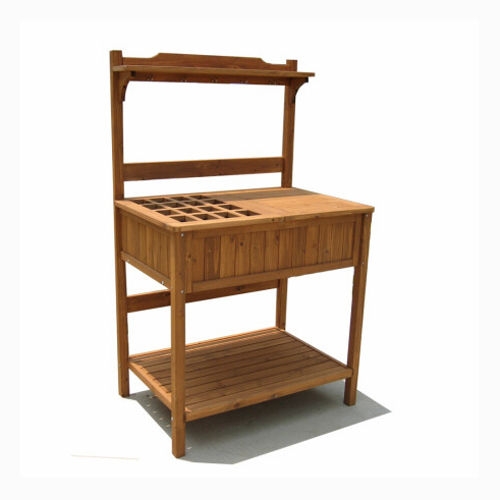 Beautiful potting bench with recessed storage! This sturdy potter's bench features spacious upper and lower tiers for use as storage, work surface, or to double as a patio buffet table. I have had one like this for several years and love it. I put cup hooks under the top shelf to hang garden tools and have plastic tote boxes on the bottom shelf to store potting soil bags and other garden items. On the top shelf is a radio (have to have music to work by) and store seed packs in a 3x5 card file box. The grated side is perfect for potting and recycle the soil that doesn't make in the pots.